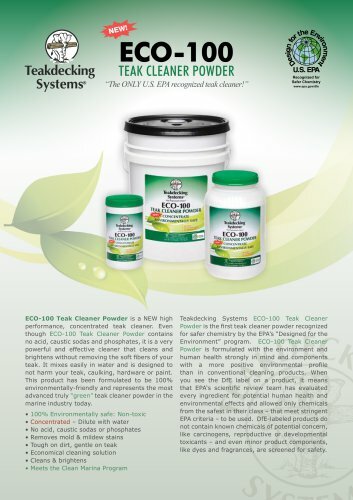 Teakdecking Systems8 ECO-100 TEAK CLEANER POWDER “The ONLY U.S. EPA recognized teak cleaner!” ECO-100 Teak Cleaner Powder is a NEW high performance, concentrated teak cleaner. Even though ECO-100 Teak Cleaner Powder contains no acid, caustic sodas and phosphates, it is a very powerful and effective cleaner that cleans and brightens without removing the soft fibers of your teak. It mixes easily in water and is designed to not harm your teak, caulking, hardware or paint. This product has been formulated to be 100% environmentally-friendly and represents the most advanced truly "green" teak cleaner powder in the marine industry today. • 100% Environmentally safe: Non-toxic • Concentrated - Dilute with water • No acid, caustic sodas or phosphates • Removes mold & mildew stains • Tough on dirt, gentle on teak • Economical cleaning solution • Cleans & brightens • Meets the Clean Marina Program Teakdecking Systems ECO-100 Teak Cleaner Powder is the first teak cleaner powder recognized for safer chemistry by the EPA's "Designed for the Environment" program. ECO-100 Teak Cleaner Powder is formulated with the environment and human health strongly in mind and components with a more positive environmental profile than in conventional cleaning products. When you see the DfE label on a product, it means that EPA's scientific review team has evaluated every ingredient for potential human health and environmental effects and allowed only chemicals from the safest in their class - that meet stringent EPA criteria - to be used. DfE-labeled products do not contain known chemicals of potential concern, like carcinogens, reproductive or developmental toxicants - and even minor product components, like dyes and fragrances, are screened for safety.